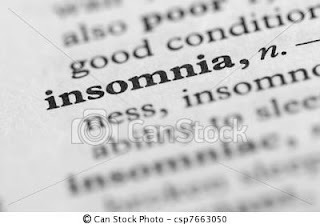 I have insomnia - it's something I've had for years: sometimes it's just a case of not being able to go to sleep, but we all have that. Other times it's repeated waking-up throughout the night, but again, everyone gets that once or twice. 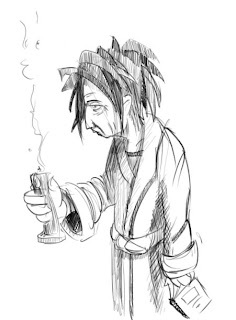 However, every now and then, I get hit with the actual inability to fall asleep, as though my entire body is rebelling against the notion of relaxation. As a child, I hated bedtime - most children do. I felt as though I was missing out on some great secret or immense amounts of fun that the grown-ups had when the kids went to bed. I would force myself to stay awake until I heard my parents climb the stairs to bed and only then was I satisfied that I wasn't the only person in the world trying to get to sleep. As I grew older, and had a TV in my bedroom, I would put late-night programs on, feeling naughty that I was watching shows that the adults obviously didn't want me to see (I used to love Eurotrash as a teenager!) 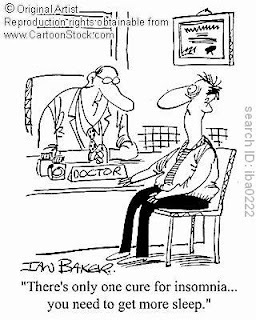 When I moved out to college, I loved the freedom of dictating my own bedtime and would stay awake as long as I could. Throughout my working life, I have mostly had evening jobs in bars and restaurants: or have been performing in shows which obviously finish late, and fill you with adrenaline which is never conducive to a good nights sleep. Often I don't sleep because, oddly, I sometimes feel my most creative late at night. Maybe it's a lack of other distractions (people on Facebook are all asleep, there's rarely anything good on TV, etc) that my muse wakes up and starts my creative juices flowing. I have been known to sit awake all night rhinestoning a corset, sketching a new costume or choreographing a new routine. I usually don't mind this kind of sleeplessness as at least I feel as though I am being productive during the long, dark hours. 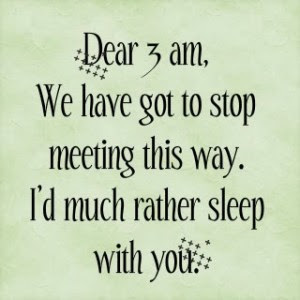 Worst of all though, are the times when I simply can't sleep. I lie awake, my mind a blank, watching the clock tick round the hours, and there is no apparent rhyme or reason for this inability. Last night, for example, I went to bed around 11:30 (a relatively early time for me!) and fell asleep quite quickly. (I may have had rather a lot of pink wine) However, at about 1:30, I was suddenly awake for no particular reason, and that, as they say, was that. I tried everything: I put movies on (Indiana Jones if you were wondering), I played monotonous games on my iPhone, I read an entire book, I (almost) accidentally kicked Boyfriend awake to keep me company and when he just snored and turned over, I admitted defeat. As I eat toast downstairs in the kitchen at 5am, my equally nocturnal housemate made me a cup of tea and the cats came to keep me company for a while. I read blogs online, looked at pictures of badly taxidermied animals, played with my blogger layout (what do you think? ), and mindlessly followed peoples links on Twitter and Facebook. I have managed to nap a little bit today though - I dropped off around the time Boyfriend left for work (with instructions to buy lottery tickets) and dozed intermittently until about midday. However this is not restful or rejuvenating sleep and I have been wandering around the house like a zombie all afternoon, with the same movie on repeat (again Indiana Jones if you were wondering - the same one I failed to fall asleep to last night) I can't coordinate my limbs enough to make a cup of tea, and therefore am relying on the munificence of my housemates to shout out when they are boiling the kettle. I am forgetting things - it took four trips up and down the stairs to load the washing machine as the first time I went downstairs I took the powder and left the clothes, then in my worldly wisdom took the powder back upstairs to get the clothes, took the clothes and left the damn powder box on the desk. Then couldn't find it when I stomped back upstairs again. I can't type, little noises make me jump out of my skin and my vision is blurred. I am refusing to have a nap, however, as that would just mean I can't sleep again tonight! According to Wikipedia, I have what is called Acute Insomnia, it is usually stress related and short-term (though repeats the short-term patterns over and over again) and it suggests that periods of sleeplessness will last for a period of less than a month. So if you see me over the next few weeks, press a coffee into my hand (Starbucks skinny white chocolate mocha with three sweeteners please), pat my head gently and try to understand if I can't string a sentence together or bump into inanimate objects. I sympathise entirely, as I suffer from exactly the same thing. Sudden creative fits leading to sitting madly typing at 4.30 am. Mind zooming round and round and round in circles, embroidering on the same one idea until by 6 am I have created something that would have scared Hieronymus Bosch. Lying there waiting to sleep and having nothing happen for hours and hours and hours. But for me the worst is the dreaded 'You are too tired to sleep', the state of exhaustion so acute that it seems to actually prevent sleep, as I simply feel too terrible (from exhaustion) to actually relax enough to go to sleep. This is an absolute nightmare, as it is followed by the sort of day you describe: bezombied incoherence, never quite managing to get anything done. And this can go on night after night. With the lesser forms, I find that a nice warm drink (sugary) and reading for about an hour will generally kill the thing off and let me sleep. 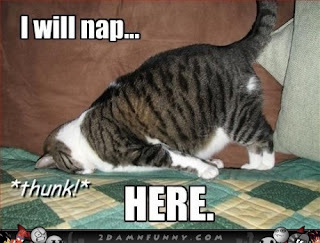 However, with the dreaded 'too tired to sleep' I just have to wait until I am so weary that I simply collapse. Then I tend to sleep about 15 hours, and wake up feeling terrible, but after the next night I feel great again. So again, my sympathies to you on suffering this dreadful affliction.